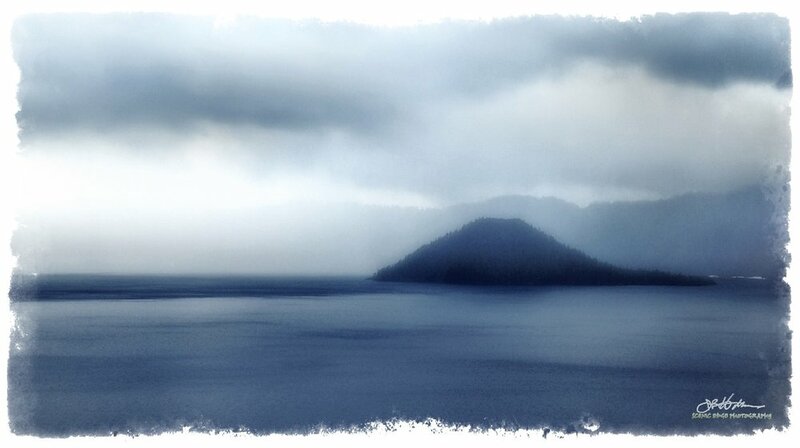 A cold front pushed through just as we were headed up north from the head of Upper Klamath Lake in south-central Oregon. Wind began to blow hard and the sky turned dark. We wound our way west towards the Cascades as scud, a cloud variant that is low and ragged, began to appear just as we reached the end of the valley floor. The wind ravaged birch trees appear to be remnants of a first or second generation timberland that once was here in what is now pastureland. Not many of these trees were standing. I was drawn to this scene because of the scraggly stand of trees, interesting sky, and range of contrast. This is a digital image with an old film-like edge I created using software tools. I rendered it to look as if it was produced with a photographic darkroom easel then later water stain on the print. This version is the way I usually think of the image. I did not see Crater Lake until I was fifty. Crater Lake has always interested me as I had been aware of this mountain that had exploded in prehistoric times through books and television. I came close to passing by Crater Lake earlier when another couple and my wife and I considered going to Ashland for the Shakespeare festival for which Ashland, Oregon is known. When I told them, "Great, we can stop by Crater Lake on the way," I was met with confused looks which I interpreted to mean, "why would we do that?" So I dropped the idea. We didn't go then, instead, we went a few years later. This was the same weather system that passed through in as captured in my Klamath Valley Storm image.